I can hear you now--"Is this guy smoking crack?" It isn't big enough, fast enough, can't carry enough, it runs off batteries, whatever. I'm not advocating the golf cart (or as it's know in some parts of the country, the golf car) as your only survival vehicle. But I think you should give consideration to it as one of several vehicles that you could depend on in many survival situations. A used one of recent vintage and in good condition is relatively cheap. In 2003, I bought a used 2001 EZGo gas-powered cart, already fitted with a lift kit, big tires, lights and a rear seat, for $3,000. Not super cheap, but go find a reliable used truck for that price. A golf cart will carry more than you think. Mine is rated for 900 pounds of people and cargo. I've used up some of that with the weight of the lift kit and other accessories, but I can still carry around 800 pounds. That's 2 200 pound adults and 400 pounds of gear. You can do a lot with 400 pounds if you pack carefully. Why carry it on the golf cart at all? Buy a small yard trailer and use it for hauling your gear. Several manufacturers make a 10 cu. ft dumping trailer with a 1000 pound capacity. You couldn't carry 4 adults and tow one fully loaded, but you can carry two adults and tow one quite nicely. Golf carts are relatively quiet. With a good muffler, you won't hear one at 100 yards. Golf carts are thrifty with fuel. You get a lot more MPG with a golf cart than you will with a big pickup truck. That would stretch your stored fuel supply quite a bit. 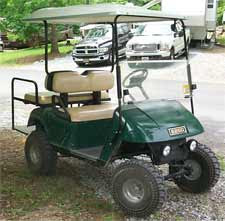 Golf carts don't require much maintenance, and what maintenance they do need is cheap and easy. An oil change is less than 2 quarts of oil, and the filter is a washable element. 2 spark plugs. An air filter element. A drive belt and a starter/generator belt. A standard lead-acid battery for starting (check the water once a week). Replace the tires, belts and battery every few years. They're more resistant to electro magnetic pulse (EMP) phenomena than most motorized vehicles--no computers. 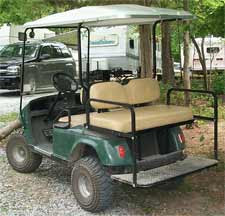 You can take a 2WD golf cart into places you can't get a full-size 4WD vehicle into. They're small and maneuverable enough that you can literally just take off through most light- to moderately-forested areas--I've done it. You aren't restricted to roads or trails except in heavy trees, brush or pretty rough country. You can use it for other things before you need it for survival. With a trailer, it makes an excellent substitute for a small lawn tractor. It can tow an aerator or spray rig with ease. And it's fun to just ride around. If you want to get resell it, golf carts are in demand. The recreational vehicle set (RVers for short) and the retirement communities are hot beds for golf cart sales. In good condition, your cart should bring a good price. Of course, there are some disadvantages. Even with a trailer, your load-carrying capacity is limited--say 1200 pounds maximum. That will be a problem when heavy hauling is needed. They're slow. If you elect to leave the low-tech governor alone (and you should, as it protects the engine from over-revving), you'll top out about 15 MPH. It takes some time to go any distance. In inclement weather, a golf cart is uncomfortable. You can add rain curtains, and there are small propane heaters available, but it won't be as weather-tight as that pickup you couldn't buy for $3,000.. Most parts are not as available as you might like. Batteries and spark plugs are easy to come by, but belts and other parts come from a golf cart dealer. Those businesses are not as common in many parts of the country as NAPA stores. Stock spares, as you would with anything else. During "normal" times, they are usually not legal for on-road use. All things considered, the golf cart can be a highly useful addition to your survival preparations, if you need a vehicle with it's properties. Cheap to own and operate, small and quiet, it fits in nicely between the full-size vehicle and shoe leather. OK, so the Bush administration canned 8 US Attorneys. So? Yeah, the Dummycrats are whining that "Oh, oh, it was politically motivated!" And? US Attorneys are political animals first, attorneys second if ever. It's the rules of the game. Face it, how many "Former US Attorneys" have went on to elected office? I know of at least one (Rudy Gulliani) who is running for President, for cryin' out loud. And we won't even mention that Saint Bill Clinton fired all 93 US Attorneys when he took office, but that's OK, since he is a Dopeocrat. Of course, because Bush is playing his usual "Don't even think about defending yourself" game, the Dems now think they smell blood and now they want Attorney General Gonzales as well. (You know, Bush can really be as stupid as the Dems think, but not the way they think. You'd think he'd have learned his lesson when he threw Rumsfeld to the Dipocrats after the 06 election, but No-o-o!) Of course, the media is in full braying pack of hounds mode, so if that all the news you get, you'd think it was the end of democracy in the United States. But this isn't about democracy, and neither is it about "those poor, poor US Attorneys"--this is about naked ambition and a lust for power that overrides all other considerations, such as the good of the country. The Democrats are so convinced that only they can govern the country that they will stop at nothing and stoop to anything to get power, remain in power and obtain more power. And all you "I'm gonna send the Republicans a message" idiots from the 06 elections? Well, you're going to get what you voted for--good and hard. Thank you so much for sharing it with the rest of us. Morons.